The Java String.getBytes method is one of the Java String Method which is used to encode the given string into sequence of bytes using the user specified charset, and return Byte array. 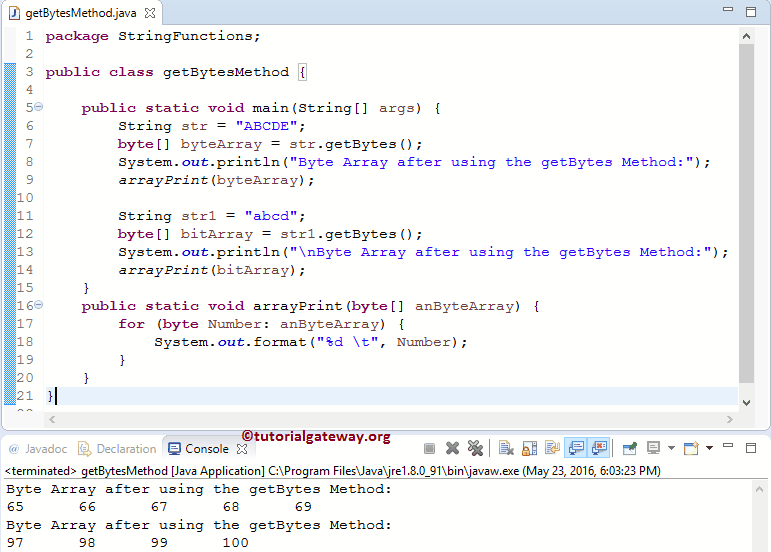 In this article we will show you, How to write Java String getBytes method with example. Before we get into the example, let us see the basic syntax of the string.getBytes in Java Programming language is as shown below. The Java Programming Language provides three different getBytes methods to encode the string. The following Java String getBytes method will not accept any argument and encode the given string into sequence of bytes using the default charset. Following Java getBytes method will accept Charset as an argument and encode the given string into sequence of bytes using the user specified charset. It means, we are allowing the user to specify the Charset (dynamic). The following Java String getBytes method will accept Charset name as an argument and encode the given string into sequence of bytes by invoking the specified charset name. It means, we are calling required Charset name (static). The Java String getBytes Method encodes this string into sequence of bytes using the user specified charset, and it will store the result in a byte array. TIP: Java String.getBytes Method throws UnsupportedEncodingException so, it is always advisable to use Try catch block. The Java String.getBytes method is used to encode the given string into sequence of bytes and returns byte array. In this Java program, We are going to encode the string using the platform default charset. TIP: Please refer ASCII Table to understand the byte values. Following Java String getBytes statements will call the public byte  getBytes () method to encode the above specified string (str & str1) into sequence of bytes. From the above screenshot you can observe that, both these statements are using the platform default charset. The Java String.getBytes method is used to encode the given string into sequence of bytes and returns byte array. In this Java program, We are going to encode the string using the available standard charsets (Providing Dynamic functionality to end-user). Following statements will call the public byte  getBytes () method to encode the above specified string (str) into sequence of bytes. It is using the platform default charset. Following statements will call the public byte  getBytes (Charset charset) method to encode the above specified string (str) into sequence of bytes using standard charset UTF-8. The following Java String getBytes statements will call the public byte  getBytes (Charset charset) method to encode the above specified string (str) into sequence of bytes using standard charset ISO-8859-1. NOTE: From the above screenshot, you can observe that, the default charset and the standard charset ISO-8859-1 is returning same result. In this Java program, We are going to encode the string by calling the available standard charsets names (Static functionality). Following statements will call the public byte  getBytes (String Charset_name) method to encode the above specified string (str) into sequence of bytes. It is calling the standard charset name UTF_16BE. Following statements will call the public byte  getBytes (String Charset_name) method to encode the above specified string (str) into sequence of bytes. It is calling the standard charset name UTF_8. Within the below Java String getBytes statement we are assigning the default charset name.